Amar Akbar Anthony is one film which needs to click at any cost as Sreenu Vaitla has been only giving back to back flops in the recent past. The film has finally hit the screens today and let’s see whether it lives up to all its expectations or not. Amar(Ravi Teja) and Pooja’s(Ileana) parents are two close family friends who are cheated by their business partners. They get killed brutally in a well planned bomb blast and leave Amar and Pooja homeless. Rest of the story is as to how Amar grows up in life and takes revenge on the murderers of his parents. 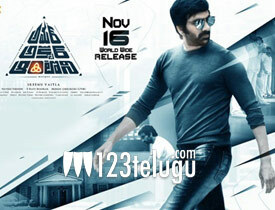 Ravi Teja is good in the role of Akbar and evokes decent comedy. The star hero manages to do well in the film and tries to control the damage to an extent. Ileana makes a good comeback, looks gorgeous and does what is required of her. Comedian Satya gets a crucial role and he does his best as spoof of K A Paul. His episodes evoke decent laughs and Vennela Kishore ably supports him with his witty humor in the first half. The first ten minutes of the film are pretty interesting and have decent family emotions. The film has gone wrong at the scripting level itself. Sreenu Vaitla has once again chosen a silly story line with basic revenge drama and has executed it on an even disappointing note. He starts the film well but right after the first ten minutes, the film falls flat and never picks from there on. Ravi Teja’s character has been given a disorder and this has been narrated in a unimpressive manner. Yet another basic drawback is that the film lacks any emotion after the first ten minutes as all the feelings showcased look forced. Also, there was absolutely no need to set the film in the US. Ravi Teja happily commits crimes all over the New York city and gets away with it easily. Sreenu Vaitla has taken things for granted as the logic goes for a toss in every possible way. There is absolutely no romance between Ravi Teja and Ileana and the music also does not help one bit. After a point in the second half, the comedians are made outright silly in a very serious FBI interrogation scene and this is where you feel like walking out from the theaters. Music by Thaman is disappointing as not one song clicks but his background score was neat. Production values by Mythri Movies is top notch as they have spent a lot to make the film look rich. Production design was neat and so were the lyrics. Dialogues were funny and especially those written for Sunil and Vennela Kishore were good. Coming to the director Sreenu Vaitla, he has got things wrong in a big way. Right from Aagadu, his comic sense and grip on the script have gone for a toss as he has been narrating his stories in a boring manner. Same is the case with this film as well as Vaitla has made things go haywire right after the first ten minutes. On the whole Amar Akbar Anthony is yet another disappointment from the likes of Sreenu Vaitla. The star director gets it all wrong as the film is a logic less revenge drama which falls flat in many ways. There are a few comic moments which might click with the mass audience but on the whole, this film fails to reach the expectations completely and has nothing great to boast about.